It was an early dinner at Jacko’s Kan-anan our host for the opening program of the event. They were also one of our generous #EAtIligan sponsors. Their grilled tuna is one of my all-time faves. I am not new to Jacko’s Kan-anan and these foods above were always served. I do not think they become luma because it is seafoods. Who would turn back eating seafoods even if you have it daily. Since I cannot eat all those stuff in the bila-o, grilled tuna became my favorite of the night with the blanched vegetables. 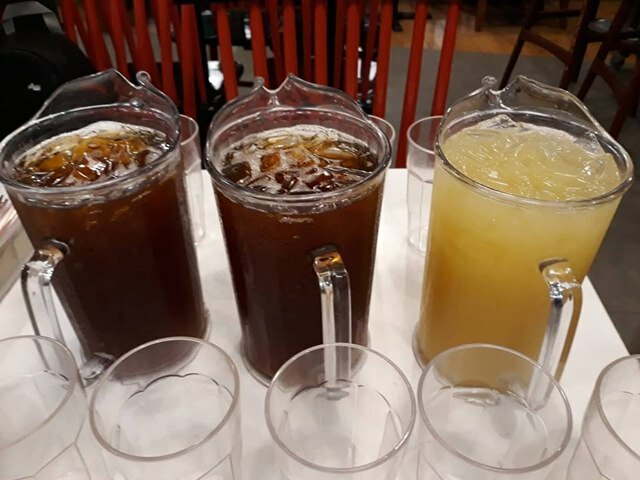 Two new ones were served which I think were first time for me to see — the driedfish (danggit) and the plain boiled vegetables with malunggay as toppings. I feasted on all those foods especially the plain boiled veggies. 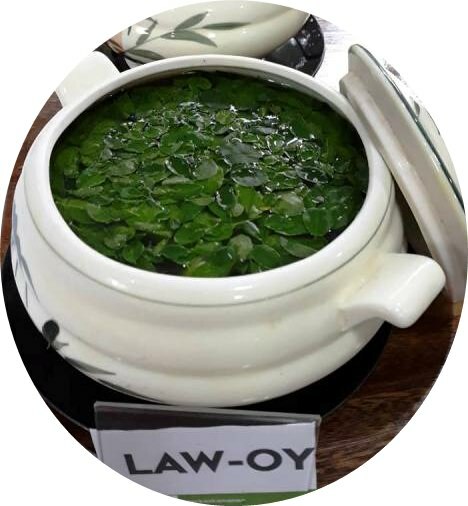 The bulad and the law-oy makes you feel that homey “luto ni nanay” feel but in a nice restaurant. 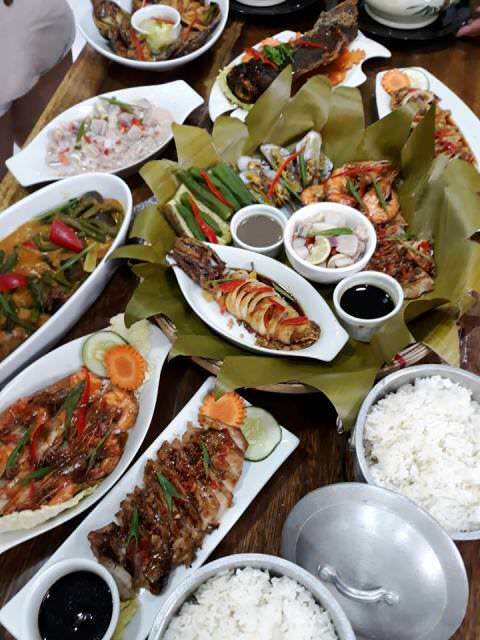 In many Fipino homes, bulad is just a plain and simple food and some even described it as viand of the poor. 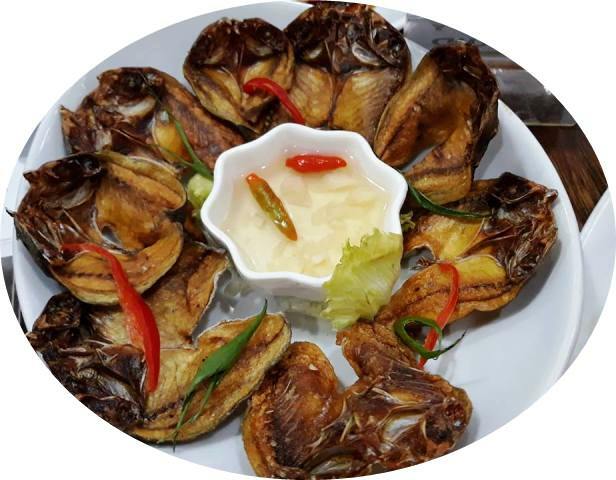 Oh well, Danggit is the bulad for the rich because it takes several hundred pesoses to get a kilo of this yummy boneless dried fish. Our desserts at Jacko’s were of course the fresh fruits (watermelon & pineapple bits) as well as the Churro Ice Cream bowl. I did not tasted the ice cream bowl anymore with the hope not to spike my sugar level to crazy level. 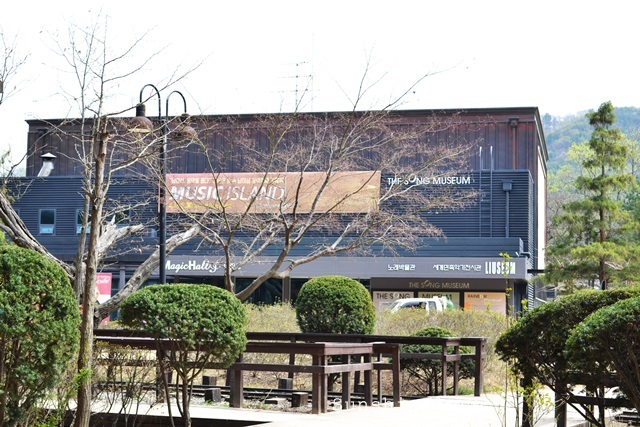 For me, Jacko’s Kan-anan is a place for families to have their Sunday lunch date or even any day of the week. They do not only serve at their restaurant but they also do catering or party size menu. If you think my post is not so detailed of what they sell to their customers, then check out this page – Their short-order menu list. 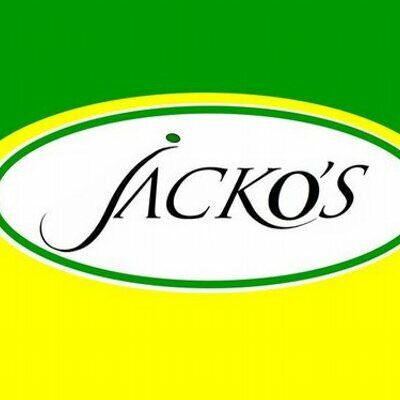 Thank you Jacko’s for filling our tummy early in the night. Paseo de Santiago is now one considered as one of the “not to be missed” tourist attraction in the City. 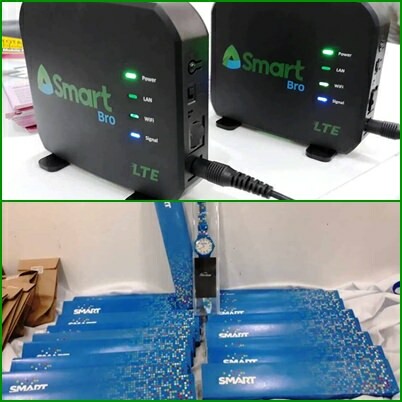 It is located in Brgy. Santiago. 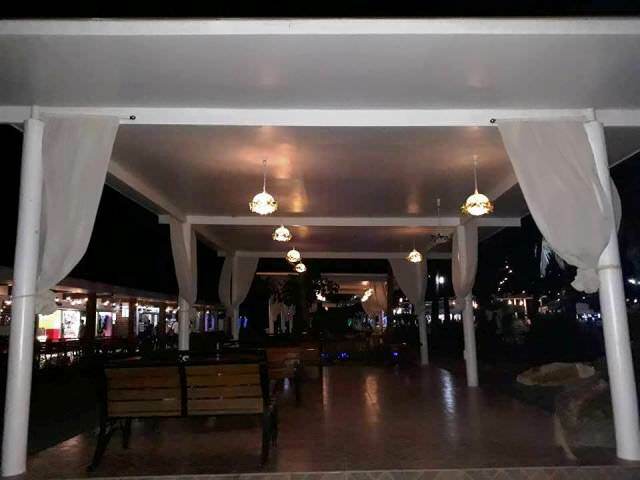 A private owned place – it opened its door to the public after it was designed into a family-friendly park where everyone can relax and enjoy the view of the sea especially in late afternoons. This is a Friday night so the place was a bit packed with people – family having picnics, couples on dates, and others who were enjoying the amenities of the palce – all enjoying the music made by the assigned band to perform during this evening. We showed off the place to our cdo-based participants. 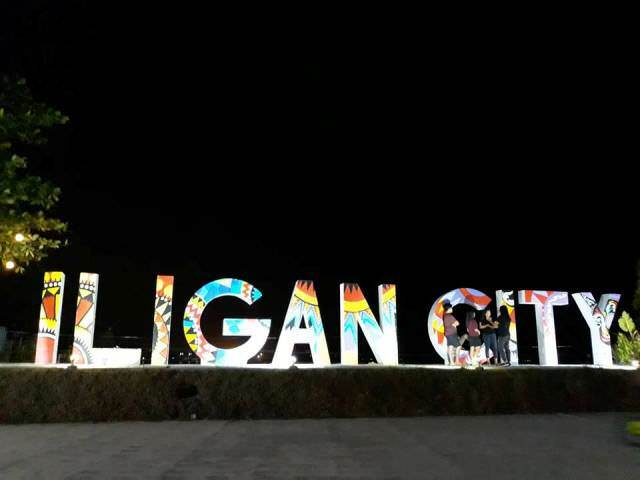 We had group photos taken with Iligan City as our backdrop. 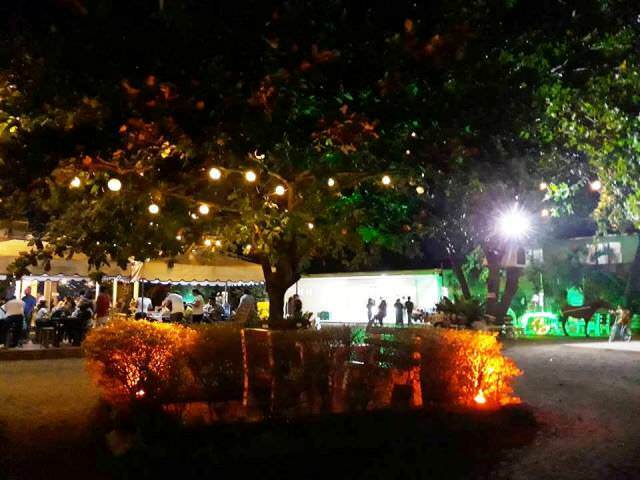 The ambience of the place was really conducive for couples and families to enjoy the evening. You can go there anytime with our without food as foods are available from the shops. Dinner kind of foods not just snacks are readily available in the area. I’ve seen structures which I think the place can be a venue for a wedding reception or maybe a debut or a birthday party to be remembered. 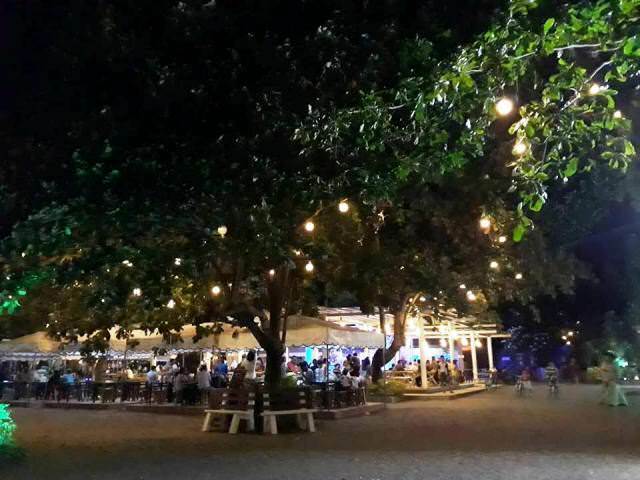 The place is called Paseo de Santiago which means a plaza or a walkway for strolling or leisurely walk or stroll, especially one taken in the evening located in Barangay Santiago. Just a few meters from the main highway. There is a minimal entrance fee upon entering the place. The biggest pizzaria in Iligan City! 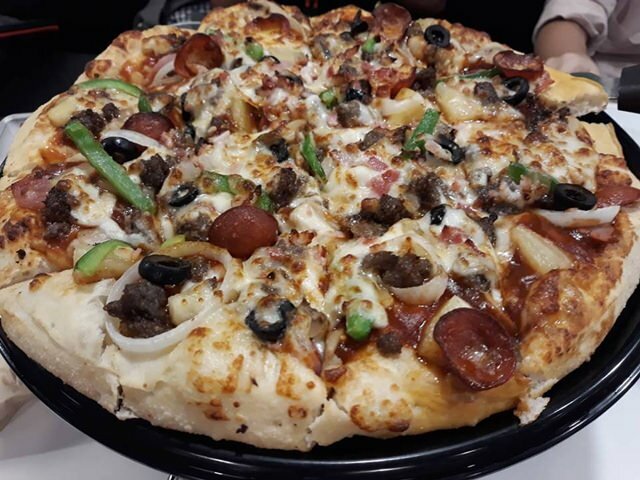 The place for a barkada to enjoy their favorite pizza and pasta! 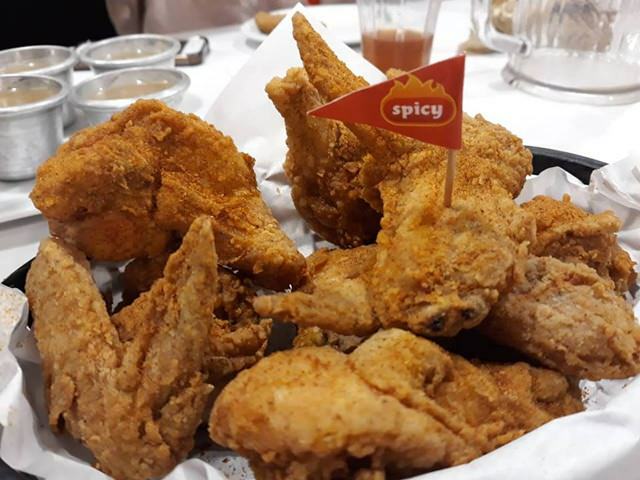 So that night, they served us for a taste for their best selling pizza and their cool drinks and of course their juicy chicken which you can with with spicy flavor or none. This is my ever ever favorite kind of pizza! Even my daughter, this is the best after any beef overload toppings. I love Greenwich but it is not advisable for me to frequent the place and indulge such yummyness or else I will leave this Earth earlier than everyone else. So when we come here, once in a blue moon, we really indulge to our heart’s desire. This is the kind of flavor who loves anything with bacon can enjoy. 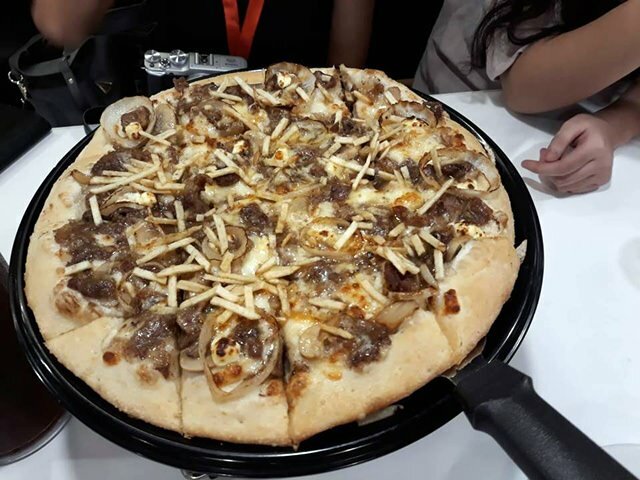 What I love about GW is that, they have varied flavors that even those who do not eat any meat, can still treat themselves to pizza because they just love pizza. I had two glasses of these drinks! Now our stomachs were filled to the brim. ha ha ha. I blame it on the hard-to-resist foods! Eat Iligan is here once again. This is IBSes 3rd year food crawl event. I always consider it as a privilege to be invited because I am a member of the society. Food tasting for 3 days? Who in their right mind would say NO to that except they have a much important appointment to meet somewhere. So again, I am in this year. 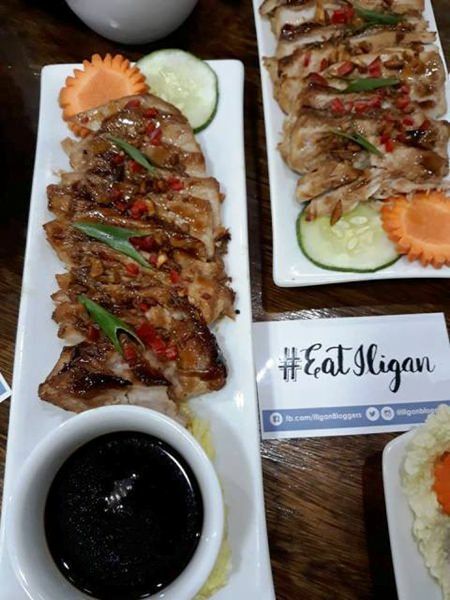 Lots of my friends are asking me what is Eat Iligan and why I am posting such yummy foods on my Instagram and they are warning me that they gonna unfriend me for posting such. Lols. Well here is the official background of Eat Iligan. 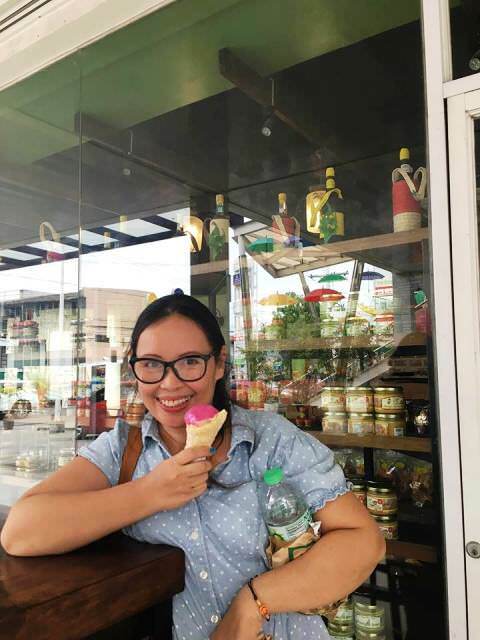 Eat Iligan is an invitational Iligan Food Appreciation Tour organized by the Iligan Bloggers Society, Inc. 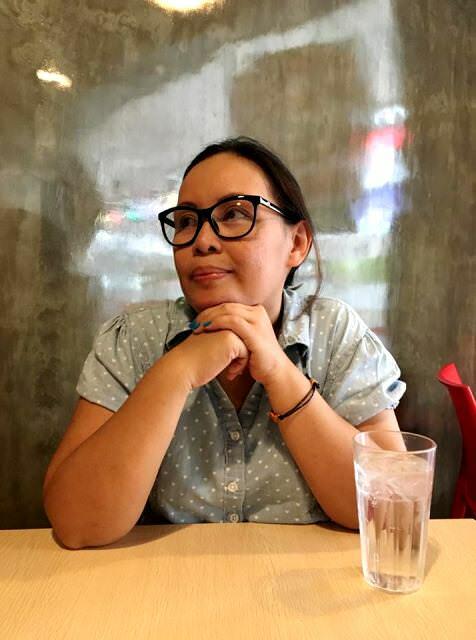 The 3-day event seeks to highlight Iligan City’s local food scene in various social media platforms. Social media influencers who have a considerable following in their blogs and social media accounts like Facebook, Instagram, and Twitter are be invited to participate in the event. 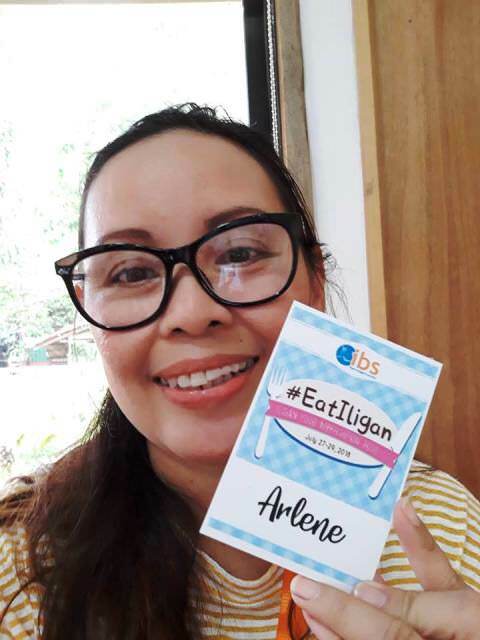 The hastag EatIligan #EatIligan is being used throughout the event. The event was started with a short program on a Friday evening. 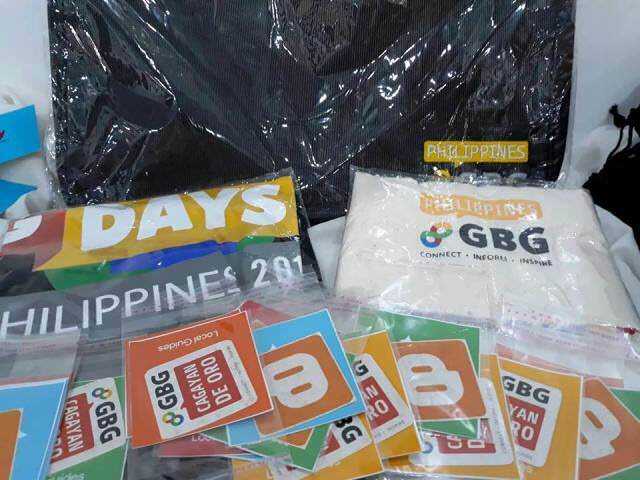 Everyone – locals and visitors from Cagayan de Oro were warmly welcome by the organizers. The official welcome was done by the IBS President. 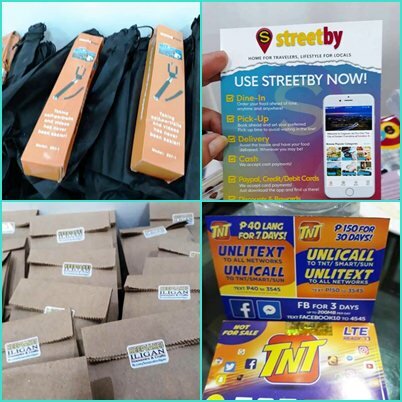 All the generous partners were introduced to us and some even took time to do some presentation such as Streetby and the GBC Cagayan de Oro. IBS president giving the warm welcome to all the participants. The following are the partners of the three day event whom we owe a BIG TIME THANK YOU! 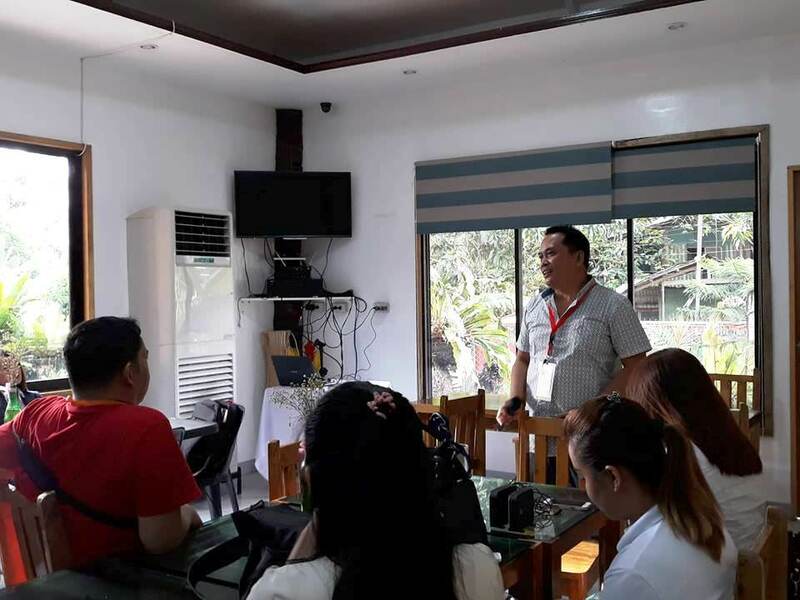 Local Government Unit of Iligan City through Hon. Sol Bacsarpa (https://www.facebook.com/Atesolbacsarpa/) – for the tourism bus! The list of participating food joints or restaurants were given to us. After the opening program, we had the hearty and yummy Jacko’s meal. Busog na busog that we head off to Paseo de Santiago to see the place and walk around so our tummy will grind the food faster and will leave space for the Greenwich offers. Photos and words will be on the next post. July is a happy month for me because it is my birthday month. Irregardless of how my day went, I always feel happy during my anniversary of the day I was born. I’ve known of others who feel sad when their birthday is approaching because the new year added makes them feel old. But not me – aside from being grateful to God for a new year, I am always happy of the new year. Big thanks to her Omi for letting us use of the nicest room in the resort. I was in Bohol on the exact date of my birthday. 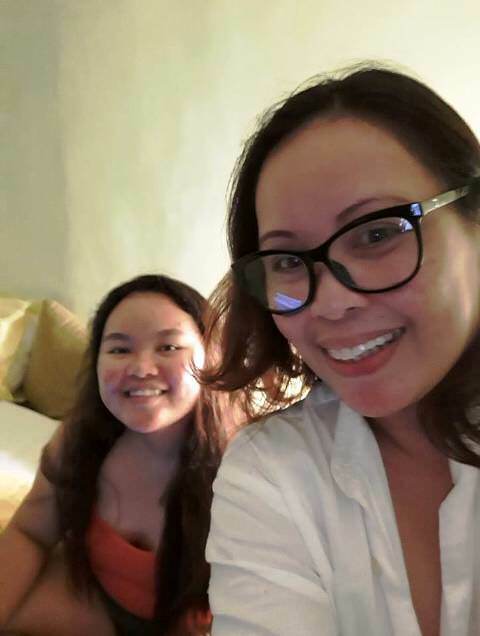 I spent the weekend with my daughter as she was in a far away island accompanying her Omi as well as apprenticing in running a resort business. I like being on a travel during my birthday so I was really excited to go to Bohol to visit her and also feel the place again. La Estrella is one of my favorite places in this world. 🙂 Ask me why? Well, the story deserves a separate post. My day started with 5 kilometer walk/run. I feel so health conscious having lots of sweat during the early hours of the day. 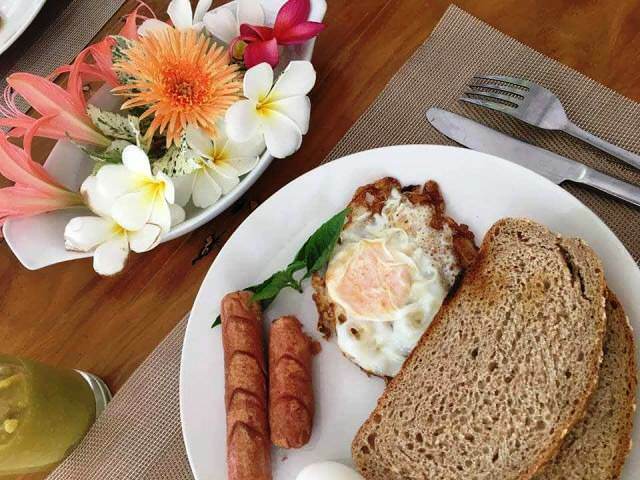 After the run, I was amazed of the lovely and sumptuous breakfast waiting for me/us. Thank you ‘te Inday for preparing an appetizing food for my birthday morning. July 23 was scheduled for me to travel back to Mindanao via boat at 10 PM. So we left La Estrella at mid day. We spent some time in the city (me and daughter had a late lunch date) before I proceeded to Jagna. Thank you to the dear daughter for taking a shot of the moment. lols! Since the restaurant of her choice is close, we decided to eat at a Chicken place. We had chicken for lunch. Chicken is the quickest and easiest and safest meat for us to order. 🙂 For dessert, I had a scope of Dragon Fruit ice cream from the Bee Farm shop just across from where we ate. Thank you to each one of you for making my day very memorable. One of the unique wish for my 46th birthday — To receive a total of 46 cards from friends around the world. I will begin counting the sent cards on the first week of August. Here’s a glimpse of the sea/beach on this birthday morning. The sky seems gloomy because of the strong winds caused by the Habagat. 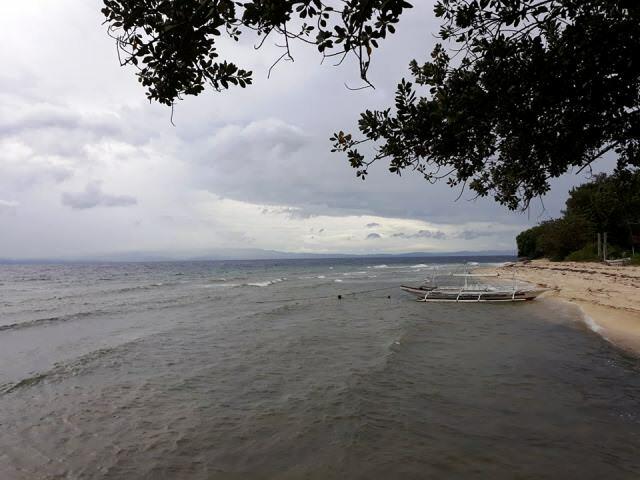 The time of the year where a boat ride can be rough and scary for those who have sort of fear of deep blue waters because she or he does not know how to swim. I thought I could swim this day. But the wind was just so strong. Even the day I arrived, the wind already sounds like I am riding a bus with an open window. lols! 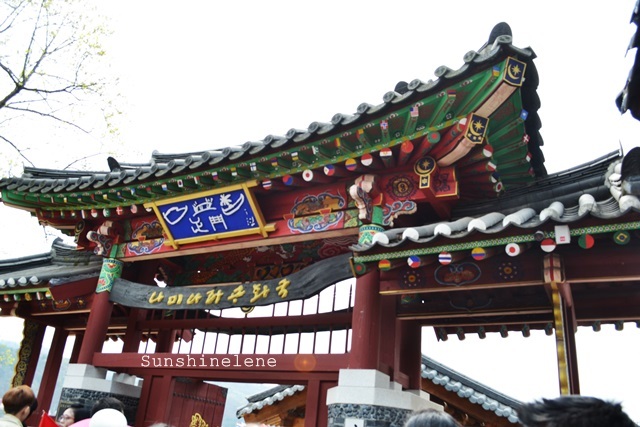 The first time I travelled to Seoul, South Korea was during the Spring 2016. There was so much places to see, but we have a little time and little money. 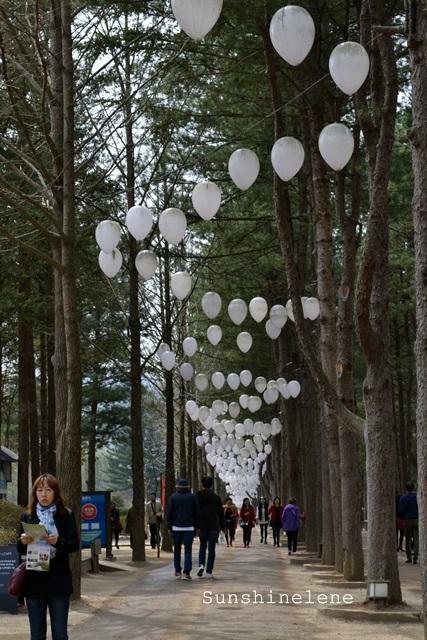 One of our favorite places during the trip was in Nami Island. 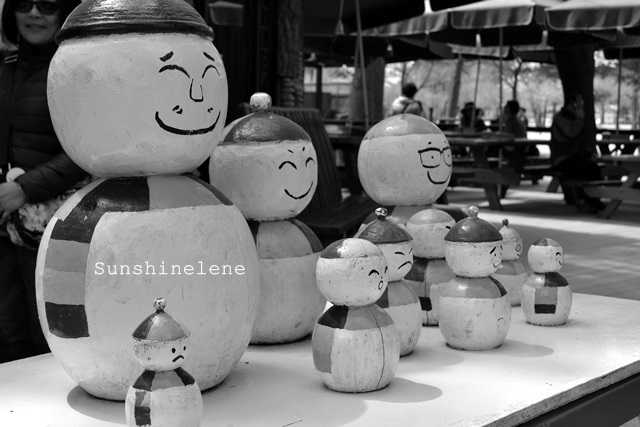 I thought I took so much photo with my camera during that Nami trip. But my folder says the opposite – possibly the photos that I took are more on object rather than the view. 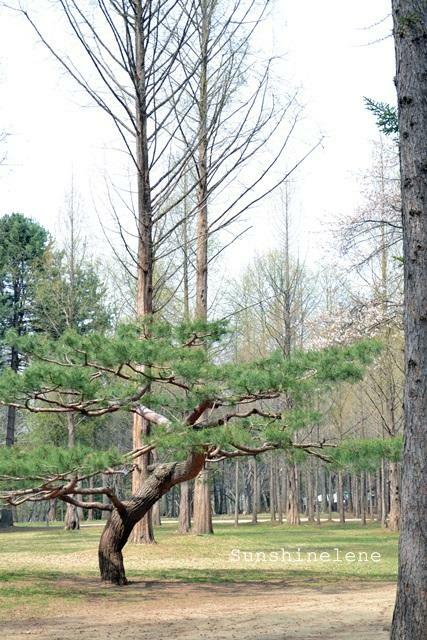 It was spring time so the trees were not verdant green, some trees are even bald. We only set 3 hours to roam the area – but in reality, I was not able to go around the whole place. Our time was eaten away by taking photos. Each of us has camera so we have our own takes and then we have “partner” takes – solo pictures must be taken with partners so that you could take turns. That’s what really happened to us. and philatelic stamps — because I love stamps! 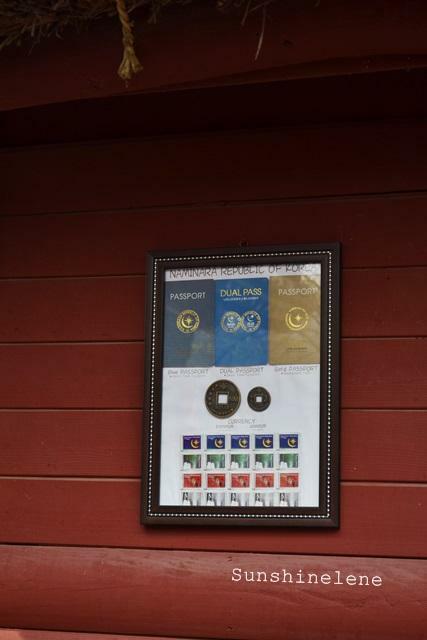 The big ancient coin is valued at 5,000 won and the smaller one is valued at 1,000 won. I failed to ask if they have stamps for sale at the counter where we bought our tickets. I wish someday I can by a Dual Passport or why not a Permanent Passport. 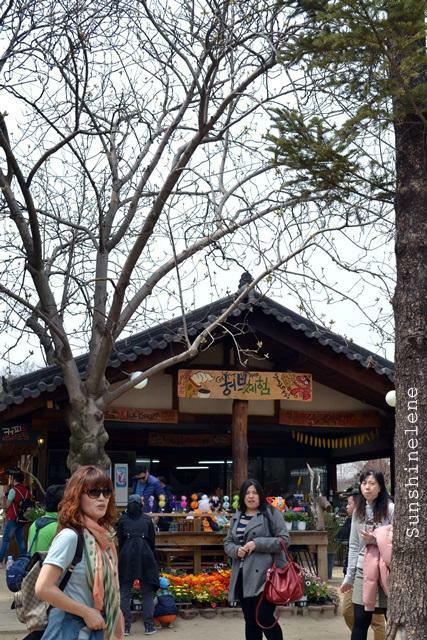 At Gapyeong wharf. We are in queue for a boat ride to the island. Look closely at the roof rods — can you spot the Philippine flag? Nami is a beautiful place all year round. 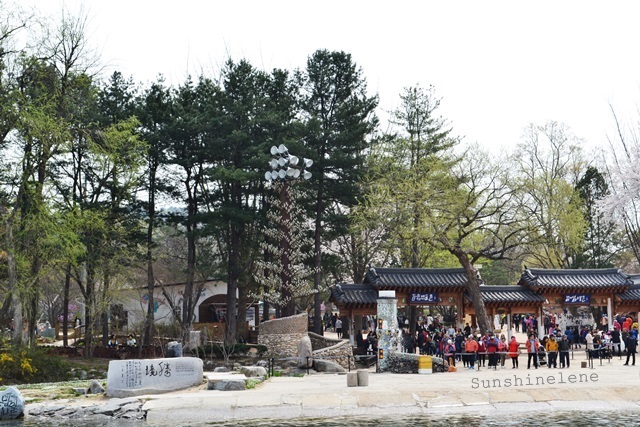 In another post, I will be describing why I wanted to visit Nami and why I love Nami. This ferry starts to leave the Nami wharf as we were approaching the Island. 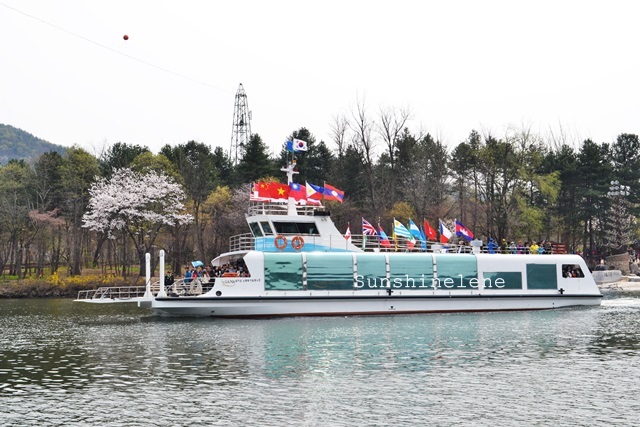 This is identical to the ferry we were on. The welcome sign with the wooden map of the island. I love this! 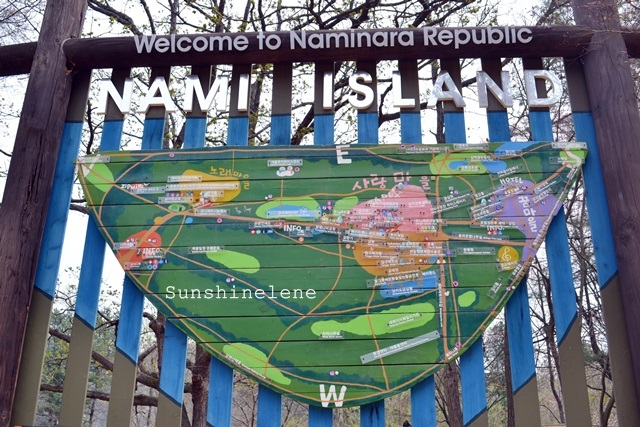 Nami is a must visit place for tourist from all over the world. 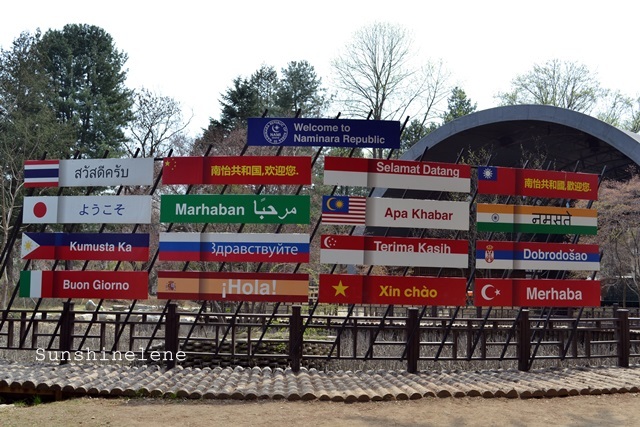 So they have this greetings in different languages right at the central pine tree lane. Because it is spring, the roads are dry and dusty and it is so obvious if you look down. 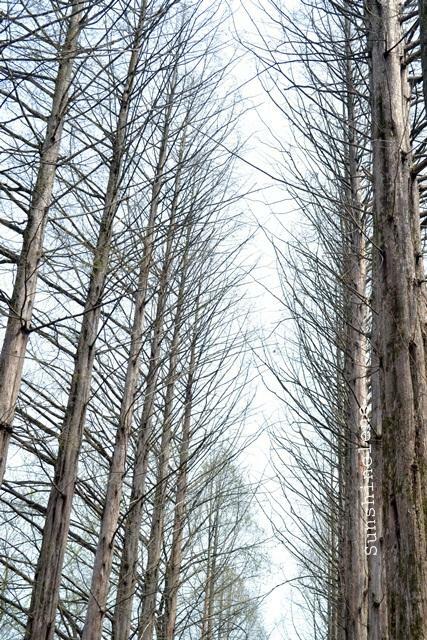 We suggest you look up to enjoy the beauty more the beauty of nature. 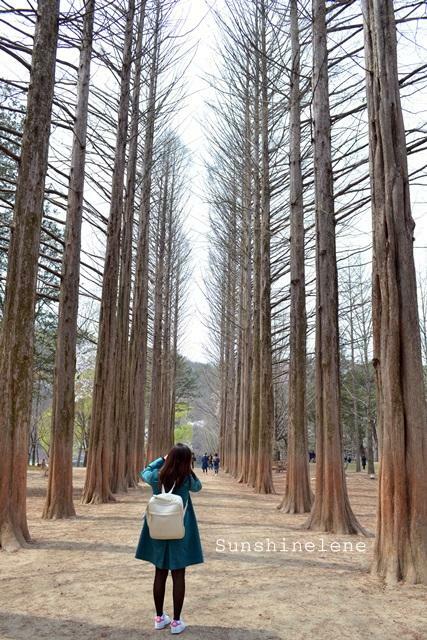 Nami Island visit in 4 seasons has been in my bucket list. Joon Sang and Yoo Jin made on their winter day date. Maple trees with budding leaves although it look like it is bald. The green trees behind are the Birch trees. 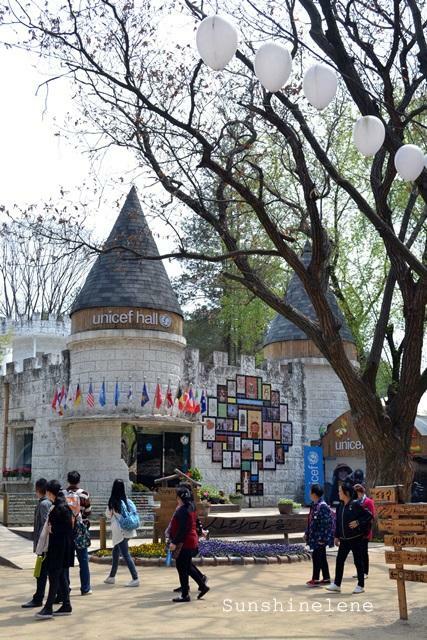 The Unicef Hall. Just for my eyes only. No time to go in and check out. Going in must be a must in the future trip. 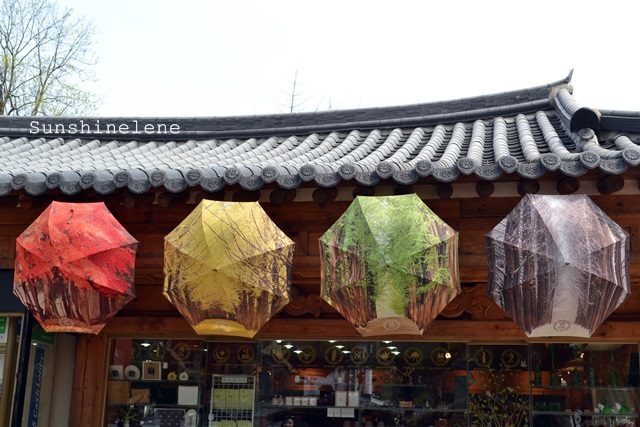 Another shop that sells souvenir items. There were several within the Island. I just took photos because I know I do not have time to go in there and check their stuff. Although I went in to one to purchase a ref magnet and a couple of philatelic stamps. I wish I had time to write cards and post it here. 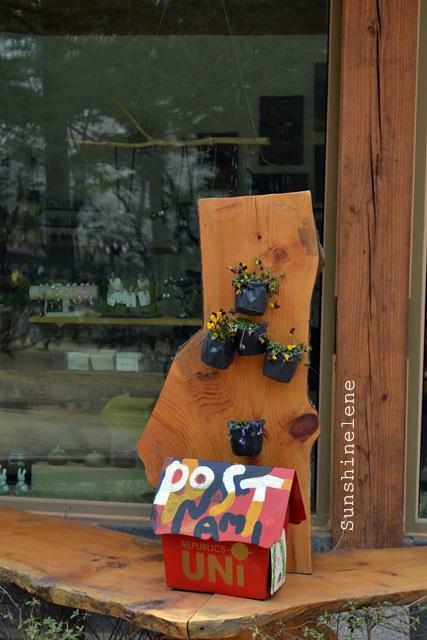 There are several postal shops in the Island. I have to note that I should do this next time. I’d like to think that this tree stood poised in whatever season comes to the Island. I’d like to guess that this angles will look very nice during the summer season. 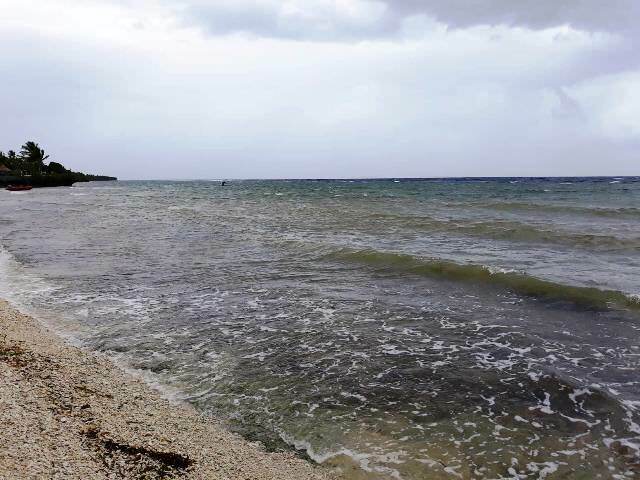 Based on this post, you might say that it is not worth to visit the Island during the Spring. For me, in spite it looks a little bit dull in many angles, visiting it in spring is not a waste of time. 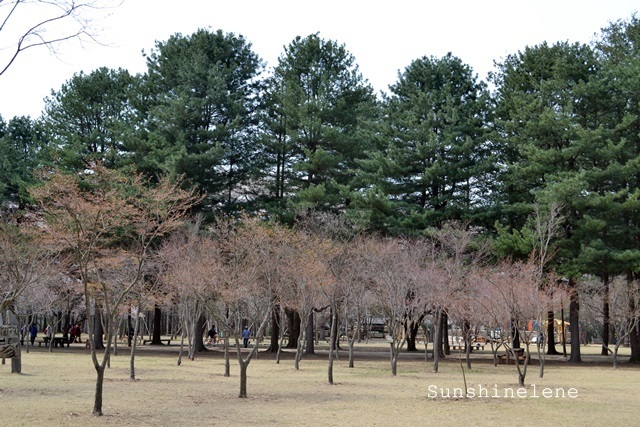 Nami Island is pretty in all seasons. Each season brings out a different and unique beauty in spite the trees and many memorable spots look the same. So here’s my last photo for this post, a photo I took as we left the wharf. Annyeong Nami! Until the next time! 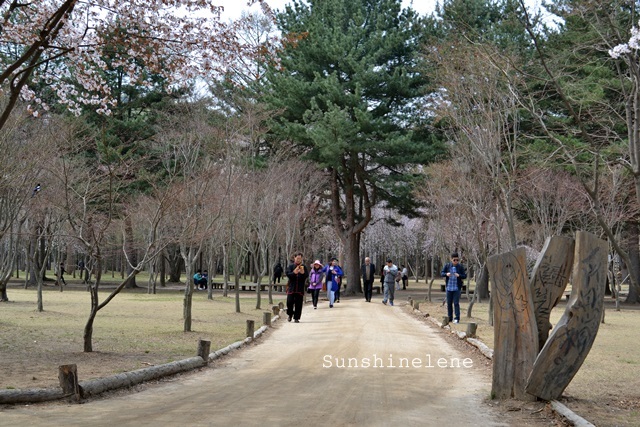 I had more photos to share but I will do it in another post because those are more of Winter Sonata stuff.